Mercedes driver Nico Rosberg joins Tom Clarkson and Allan McNish as they look back on Friday's free practice sessions for the Bahrain Grand Prix. 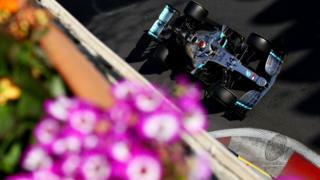 Rosberg was fastest in second practice ahead of Lewis Hamilton and insists that the relationship between him and his team-mate is "relaxed". Clarkson and McNish also look at whether Ferrari are really a threat to Mercedes this weekend and a troublesome day for McLaren's Jenson Button.